I'm posting this FYI for the pro-life geeks out there who are curious about lesser known methods of killing fetuses. My interest was piqued by this study investigating the effectiveness and safety of umbilical cord ligation as a method of feticide. The issue, of course, was safety to the healthy twin, and the mother. The age of the pregnancies in question were 17-27 weeks. I was not able to get the exact method of umbilical cord ligation. Ligation consists of cutting off the blood supply of the umbilical cord so that the fetus dies from lack of oxygen. It's not a new method of feticide, as shown by this and this abstract. This Dutch paper gives a lot of good background on the procedure. 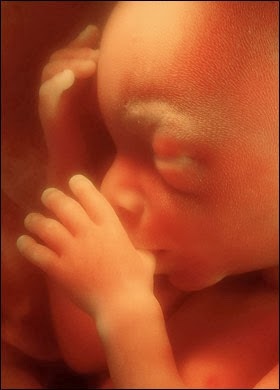 This method is very desirable in monoamniotic twin pregnancies (where there is only one amniotic sac) because of the very high prevalence of anomalies in monozygotic pregnancies (15-20%). [Note: Monozygotic pregnancy=identical twins]. In monoamniotic pregnancies (one amniotic sac= 1% of all twin pregnancies) 70% of first trimester pregnancies experience cord entanglements. So there is a risk of the healthy twin being asphyxiated by his sibling's cord. The purpose of this feticide is to kill the disabled twin to save the healthy one. Other methods of feticide, notably lethal injections, pose a safety risk because the lethal agent could affect the healthy twin, or the mother. The Dutch paper says that on top of cutting off the umbilical cord, it's important to transsect the umbilical cord to make sure it does get tangled in the healthy twin. To do this they used a laser. So I like to think of these as laser abortions. While I can see the potential for using them in singleton pregnancies or in clinics. The typical suction abortion is surgically easy, whereas lasering a fetus probably requires a higher degree of skill, not to mention the equipment is more expensive. Just from what I've read on my own, abortionists tend to stick to the method of abortion they know best. So in Japan, for instance, abortionists use D & C to do abortions even though suction abortions are probably safer (to the mom!) because that's what they've always done.